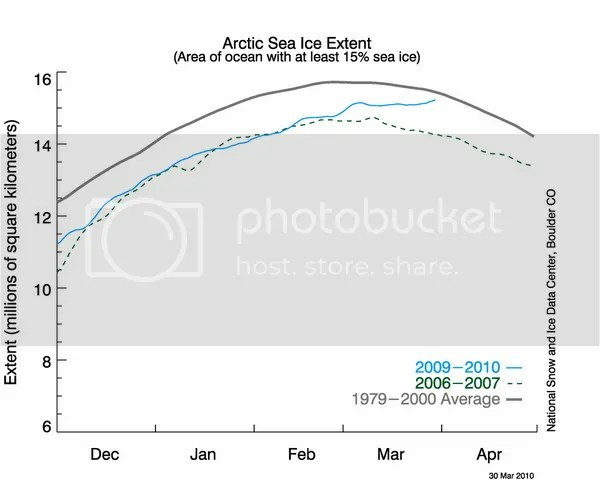 Arctic Ice Returns To Normal; How Will Global Warming Alarmist Fearmonger Next? The latest nail in the global warming coffin! Remember all that alarmist nonsense about the Arctic melting with the consequences of the Polar Bears dying and the planet flooding? The alarmists pointed to thinning Arctic ice as proof the planet was warming and that we must listen to their dire predictions and raise the cost of everyone’s energy (as if that would do anything to slow warming). Steven Goddard and Anthony Watts post additional measurements from The Danish Meteorological Institute, the Norwegians and advanced satellite instruments which all show the same thing. How long will it be before global warming alarmists who used thinning ice as proof of global warming declare that the increase in ice is also proof of warming? And will those reporters who moaned about an “ice free Arctic” report this news? I gave up ever hoping to reason with the “blame man for global warming” crowd when I heard that this winter was so damn cold because the planet was actually so damn hot. I’ve also long-since given up on the mainstream media ever being fair or honest in their reporting. Sorry to link the global warming hogwash with the ObamaCare hogwash, but I can’t help but point and laugh as I see all the crappy leftist global warming demagoguery over the last twenty years turning to dust now even as we get ObamaCare rammed down our throats via a wave of crappy leftist health care demagoguery. Alternative title: Send in the Psycho-babblers. The so called “science” of global warming is increasingly being revealed for the straw man it always has been (see my articles: “What the Science REALLY Says About Global Warming“, and “What You Never Hear About Global Warming“, as examples). Yet the more evidence that discredits the theory of anthropogenic global warming, the more hysterical its proponents become. The global warming debate, a top NASA scientist says, is over. Now, he adds, the issue has turned urgent. The head of NASA’s Goddard Institute for Space Studies, Hansen was in St. Paul with Arctic explorer Will Steger to participate in several forums Monday at the Science Museum of Minnesota. He was one of the first scientists to issue warnings about global warming more than two decades ago. Already, the Earth’s surface temperature is 1 degree Fahrenheit warmer than it was a century ago. Many climate scientists predict it will rise many more degrees in the next century, melting glaciers, raising sea levels and leading to other ecological changes. So here we are: an incredibly weak scientific case for what amounts to an enormously costly socialistic redistribution program, and global warming advocates becoming increasingly over-the-top in their rhetoric. What comes next? Dennis Prager has said that he majored in Soviet studies to learn how the other side thought. And he has said that his studies of Soviet totalitarian communism revealed numerous parallels with the mindset of the American liberal. So how did the Soviets deal with their dissidents? They put them in gulags and treated them as mentally ill.
Well, in the global warming debate, enter the white-coated psychobabblers. Those who make human behavior their business aim to make living “green” your business. Armed with new research into what makes some people environmentally conscious and others less so, the 148,000-member American Psychological Association is stepping up efforts to foster a broader sense of eco-sensitivity that the group believes will translate into more public action to protect the planet. During a four-day meeting that begins today in Boston, an expected 16,000 attendees will hear presentations, including studies that explore how people experience the environment, their attitudes about climate change and what social barriers prevent conservation of resources. Now, you might dismiss these statements, “We know how to change behavior and attitudes. That is what we do.” You might even ridicule them (Remember KAOS villain Siegfried from Get Smart? In one show he said to a pigeon, “Fly UP!” And when the bird sat there he leaned over and said, “So, you will not fly. We have ways of making you fly. Do you have any relatives in the park?“). But when white-coated “professionals” – who literally have the power to have people committed, take such a radical stand about an issue completely outside of their field and come to such conclusions about people who don’t happen to believe in global warming, it should be alarming. • News stories that provided a balanced view of climate change reduced people’s beliefs that humans are at fault and also reduced the number of people who thought climate change would be bad, according to research by Stanford social psychologist Jon Krosnick. His presentation will detail a decade of American attitudes about climate change. His new experiment, conducted in May, illustrates what he says is a public misperception about global warming. He says there is scientific consensus among experts that climate change is occurring, but the nationwide online poll of 2,600 adults asked whether they believe scientists agree or disagree about it. By editing CNN and PBS news stories so that some saw a skeptic included in the report, others saw a story in which the skeptic was edited out and another group saw no video, Krosnick found that adding 45 seconds of a skeptic to one news story caused 11% of Americans to shift their opinions about the scientific consensus. Rather than 58% believing a perceived scientific agreement, inclusion of the skeptic caused the perceived amount of agreement to drop to 47%. American Psychological Association leaders say they want to launch a national initiative specifically targeting behavior changes, including developing media messages that will help people reduce their carbon footprint and pay more attention to ways they can conserve. They want to work with other organizations and enlist congressional support to help fund the effort. In other words, just a relative few seconds’ worth of skeptical treatment opposing the doctrine of man-caused global warming sufficiently innoculated viewers such that well under half continued to buy the garbage they were being fed. The three major changes postulated to be indispensable for the building of the communist society were economical and political changes, accompanied with the changes in the human personality. The Soviet man was to be selfless, learned, healthy and enthusiastic in spreading the socialist Revolution. Adherence to Marxism-Leninism, and individual behaviour consistent with that philosophy’s prescriptions, were among the crucial traits expected of the New Soviet man. Among the major traits of a new Soviet man was selfless collectivism. Thus the parallels between the aims of the American Psychological Association (the concept of the “construction of the new man” angle becomes quite clear in the article) and the aims of the “new Soviet man” become clear. And the logical implications between the potential tactics of global warming alarmists and the historical tacts of the gulags become clear as well. These people are genuinely scary. All they lack to transform society in a terrifying way is the power to fully implement their ideas.